After a little over one week of play, the Stars have just been okay (fun stat: all six games have been decided by one goal…I’m not sure that that’s a good thing), but you know who’s been more than okay? Kari freakin’ Lehtonen. The Stars have not been particularly kind to Kari, allowing an average of over 35 shots per game. 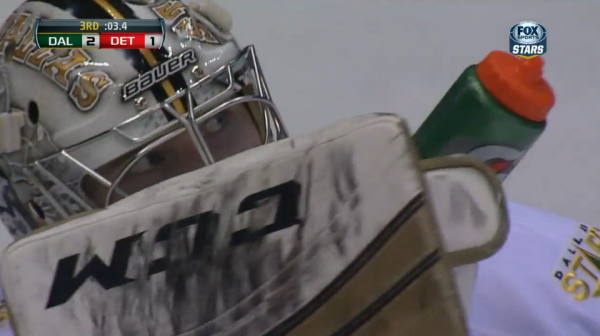 But he’s been a real champ throughout it all because Kari is just awesome. Bottomline: we would be at the bottom of the league with Washington if Kari wasn’t here. I’m still as shocked and awed that Jaromir Jagr is a Star as I was that July afternoon when I first found out we signed him. Honestly, I don’t think it’s something I’ll ever fully grasp. To have a player of his caliber playing on the Stars is such a huge honor, and it’s SO exciting. 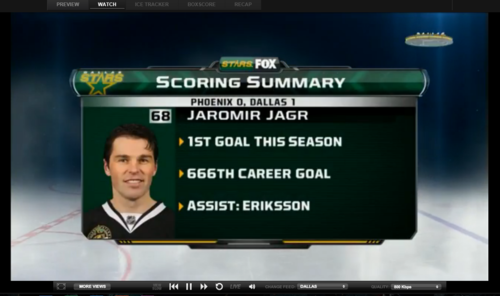 Jagr’s debut tonight couldn’t have gone any better. 2 goals, 2 assists. And the last of those assists epitomizes just why he’s a magnificent player. I’m struggling to find words to adequately describe how remarkable Jagr was tonight. It was incredible to watch, both as a Stars fan and as a hockey fan. He’s a special player. 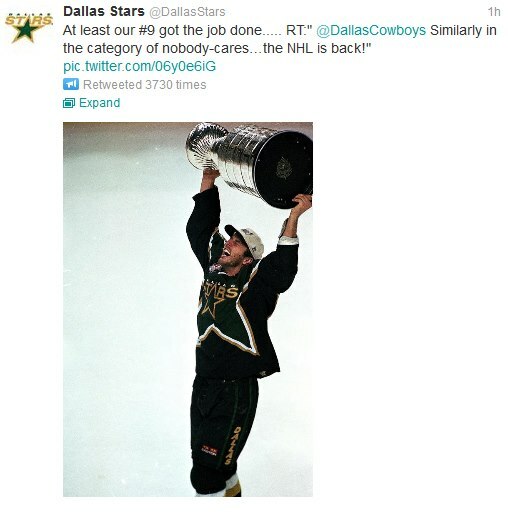 Also awesome is the fact that Ray Whitney also scored! Yes, my darlings, the two 40-year-olds were at the center of everything tonight. Fun fact: the last time a 40-year-old scored for the Stars was Guy Carbonneau in 2000. So Jagr is on pace for 192 points. Like, this is just so great. Bonus: and no loser points were given to Phoenix! With that, we’re off to a good start. Lots of youngsters. In the first period, they seemed to be doing surprisingly well, but by the time the semi-meltdown occurred in the second we began to see just how sketchy it is to have so many kids on the squad. Jordie Benn’s giveaway was particularly awful (honorable mention to Larsen’s penalties). It was so incredibly amazing to see Mike Modano and Marty Turco back with the Stars. Mo did the opening puck drop, and I almost cried out of happiness. I’ve missed that man. Turco took his place on the Stars’ broadcasting team, and it was great. I’m looking forward to having these two back where they belong. Tomorrow is Parise, Suter, and the Wild. Should be interesting. Throughout the lockout I never once made a rash statement that I wouldn’t return when the two sides reached a deal because I knew it would be a lie. I always intended to return to the NHL despite the despair and sense of betrayal they’ve caused me. My metaphor for me and the NHL is that we’re permanently in an abusive relationship that I will never get out of. The good weighs out the bad, and despite all the heartbreak they’ve caused me I could never in a million years stop being a fan. I couldn’t tell you what the NHL could possibly do to make me decide to stop watching (and this past lockout was pretty awful). I’ve been a hockey fan my entire life, and hockey has been something I can (almost) always count on to be there for me. Friends, family, and the like have come and gone, but hockey has always stuck around, and I’m sure many fans can admit to this. I always joke that I’m booked 82 nights a year, and even if I do miss a game, my heart’s always with my beloved Stars. The NHL is the best hockey league in the world, and as much as I enjoy watching my hometown USHL teams, that degree of hockey is nothing compared to the level of play in the NHL. I never get tired of watching electrifying players like Ovechkin and Datsyuk work their magic or admiring the little things players do. I love the rivalries in the NHL, from the Battle of Pennsylvania to the classic Habs-Bruins fight night. And then there are the playoffs, which are an entirely different story and possibly (try definitely) my number one reason why the NHL is the best league in the universe. How could I possibly get rid of something that makes me so happy? I Know I couldn’t, and it was never even an option for me to begin with. Never did I grapple with my decision to support a league that doesn’t seem to care for the very fans who allow it to thrive. I hate what they’ve done. I hate it so much. But leaving was never an option. And then there’s the Stars, my beautiful, wonderful team that has so much to be excited about. Tom Gaglardi wasn’t a prime player in the negotiations and neither was out NHLPA rep, Alex Goligoski, so I’m going to let our guys off on this mess. 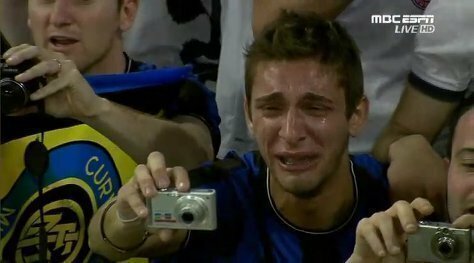 But one thing that impressed me is the fact that no Stars employees were let go due to budget issues and some higher level execs even took pay cuts to keep it that way. They didn’t have to do that, but they did. That act of kindness makes me proud to be a fan of this team. There are so many reasons for Stars fans in particular to return. If you’re a Stars fan who’s thinking of cutting ties with the NHL, here are two words: Jaromir Jagr. We have a bona fide legend lacing up for us, and that is awesome on so many levels. Then there are the equally awesome (though not as notable) additions of Ray Whitney, Cody Eakin, Derek Roy and the continued track to superstardom for Jamie Benn and Loui Eriksson. The Stars probably won’t win the Stanley Cup, but this is going to be an exciting group to watch. I know that I’ll be back the second the puck drops and that I’ll never leave. Yes, the league still has its issues, but…hockey. Early this morning the NHL and NHLPA reached an agreement, meaning this damn lockout is FINALLY OVER. I’m just a screaming and crying ball of joy right now, so I’m just going to throw out some gifs to react to this glorious news. Well hello, old friend. Long time no see! Now that we’ve reached the end of another year, I feel like recapping the year that was 2012. Over the course of the past year, we’ve lost friends and gained new ones. Been triumphant one night and devastated the next. Missed the playoffs yet again and generated hope for next time around. Of course, everything that’s happened in 2012 has been overshadowed by the lockout. Easily the story of this hockey year, the lockout has been a tough pill to swallow. I could rant for days about why the lockout is the absolute worst, but I won’t. I just have a lot of feelings about it, like basically everyone. Instead, I’d rather focus on what 2012 has been like for the Stars. We missed the playoffs again (the ridiculously tough last batch of games didn’t help our cause at all), but GM Joe made some notable moves in the offseason that are the kind that truly give a struggling team hope.